Multiverse | Where's my backpack? 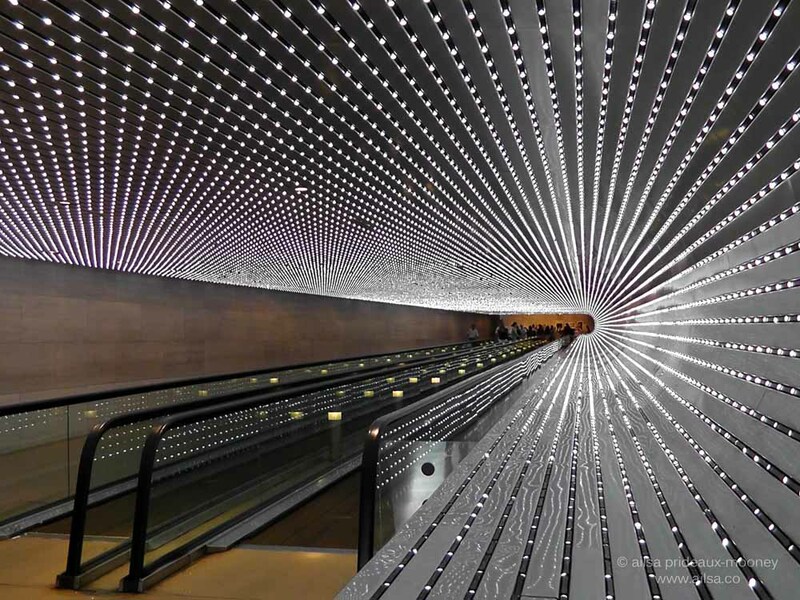 The National Gallery of Art in Washington DC is enormous. It has such an extensive collection of art that it requires two buildings to contain its treasures; the East and West Buildings. You can get from one building to the next through the Rotunda on the main floor, but if you’re looking for a different experience, go down to the concourse level. 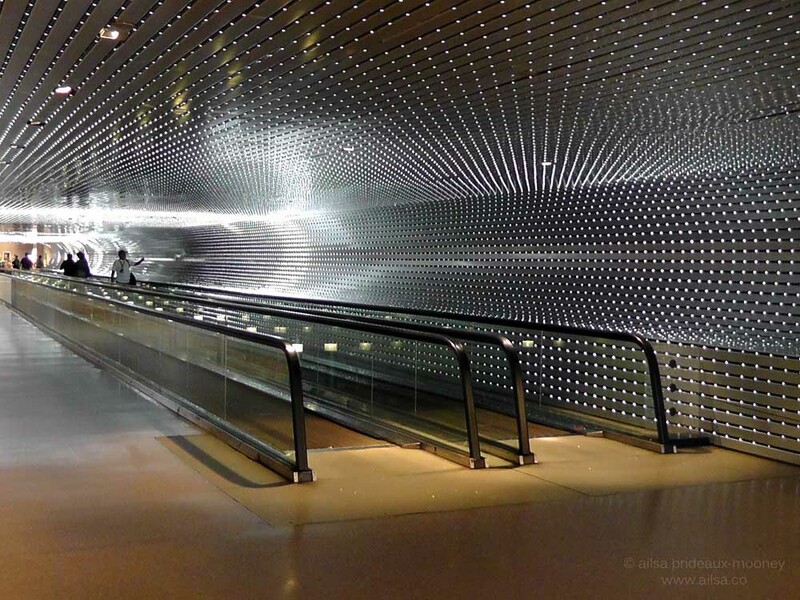 There you will find an underground walkway about 200 feet in length that is itself a work of art. 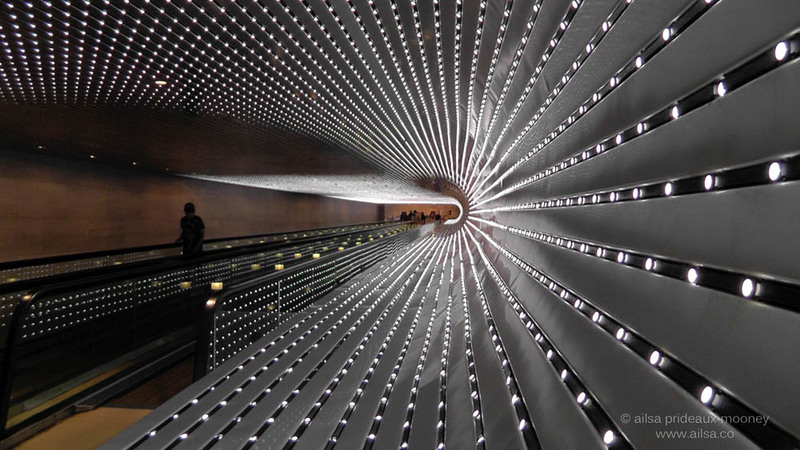 It is an LED light installation by the American artist Leo Villareal. It is called Multiverse and is so much fun, you may just find yourself crossing back and forth between buildings several times for no reason other than to experience the extraordinary trail of lights and movement. I know I did. Here are a few photos of the installation. Photographs cannot truly convey the beauty, however, because movement is intrinsic to this piece, so here is some footage I took along the way. Welcome to the Multiverse. Seriously, how much fun is that? This entry was posted in District of Columbia, Photography, Travel, United States and tagged art, photography, photos, pictures, travel, writing. Bookmark the permalink. Yes, I have been there. It is a dazzling display. Your photos are great. Thanks Drake, it’s well worth a visit if you ever get the chance. Went there all the time when I was in college!!! I could never get enough. Wow, what a great place to go to college, Andy, there’s so much free stuff to do, I could get lost in those museums! Have you completed your American travels, Ailsa? Or have you become permanently attached? Gorgeous! The National Gallery was one of my favorite spots back when I lived in DC. One of my favorite activities was their Jazz in the Sculpture Garden on Friday evenings in the summer with a group of friends and a pitcher of sangria. You should check it out if you ever get the chance (and if they still do it)! I actually caught a jazz session in the Sculpture Garden when I was there, Lauren, it was great fun. I didn’t stay too long though – it was in the middle of an horrific heatwave and I’m a wuss – I retreated to the safety of air-conditioning pretty quickly! WOW! It has another world feel to it as I was watching your video. Beautiful photos. A must see the next time I’m in D.C.
Amazing! Thanks for sharing this! Glad you enjoyed it, Andrea, I hope you get to see it for yourself sometime! IM Pei’s east wing of the national gallery has been one of my favorite places on earth since i was a teen. there are so many things to love: this installation linking the two galleries, the huge glass wall in the cafeteria (through which you can watch a million rivulets of water from the fountains above tumbling, jumping and dancing down the small sculpture staircase)….and most of all the bright, quiet spaces of the east wing where i used to lie on the marble floor and watch the lazy movements of Calder’s giant mobile above me. aah, thanks for this unexpected journey down amnesia lane. i’m glad to see you that you enjoyed the place, and i look forward to seeing and reading more about your travels. Amazing photos …. 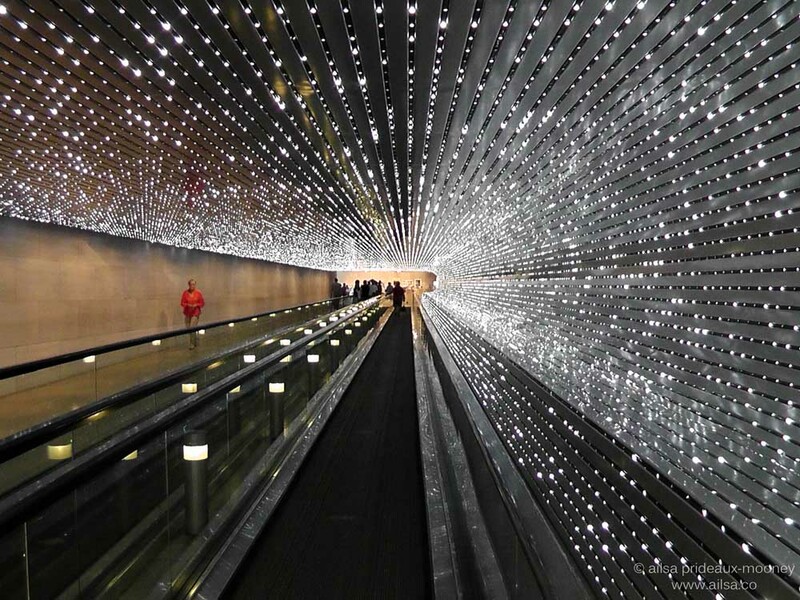 never been to DC, it reminds about O’Hara airport … but they have all the fantastic colors in their tunnel. Truly stunning photos. Haha, love it, Diana, ‘Ooh’ is what I said too! Dramamine comes to mind, but FUN! Gorgeous images … I want to go see this!!! You should, Paige, hours of entertainment, it’s really a lot of fun! Hee hee, it was the highlight of my visit, Naomi, and that’s saying something because the artwork they have there is mind-blowing. Great photos of a space I wasn’t sure how to capture. Awesome! Incredible capture. We passed thru this a few years back, but your images and clip inspire me to be there again. This is fabulous! Love how you captured it, too. It’s like a dream scene. It really is, Gilly. I wonder how hard it would be to install something similar in the hallway of my apartment? Hee hee. Wow! 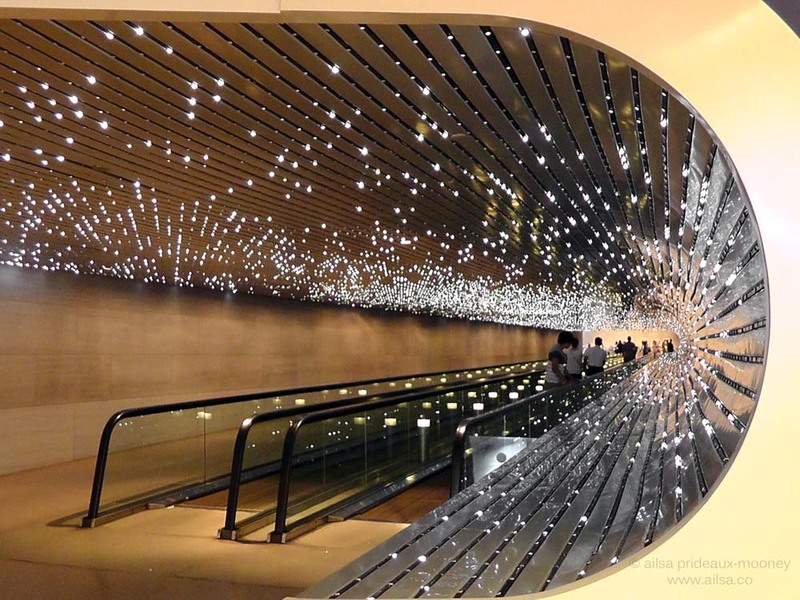 Puts me in mind of going through the Stargate in Kubrick’s 2001 A Space Odyssey! Nice!! I love your blog. I’ve nominated you for the Versatile BLogger Award. It’s up to you whether you want to accept it or not, but if you do then please visithttps://nirvanaamjad.wordpress.com/2013/04/26/yay-award-time/. I wanted to see it but I do not believe that I and see. some 20 years ago I was in Los Angeles but I rarely travel so far, and I wanted so much to see. But I enjoy with your photos and other images. Amazing photos. My son was 18 months when we visited here the first time…I think we went back and forth for an hour! It’s good to be young at heart! Your photos are simply stunning! What a great place to visit – and to photograph! Amazing!! Great photos. This is now on my list of things I must see! Mind-altering without the side effects – great pix! I enjoyed your photos, but it wasn’t until saw the video that I really appreciated the feature. It made me feel as if I was floating through space, looking at the stars and galaxies. Superb presentation! Great post. Will definitely check it out when I’m back in the DC area (later this year). Bravo from me and 160 others, couldn’t stop looking! This is just gorgeous! It seems like it might feel a bit like flying through the starry night sky. What a great way to house an otherwise banal mode of transportation! I have been to DC many many times and never saw this. Time to go back! We are going two different Sundays in May, hopefully we can fit this in. not the gallery probably, although I am way over due for a visit there too. Sigh…too little time off too little money!